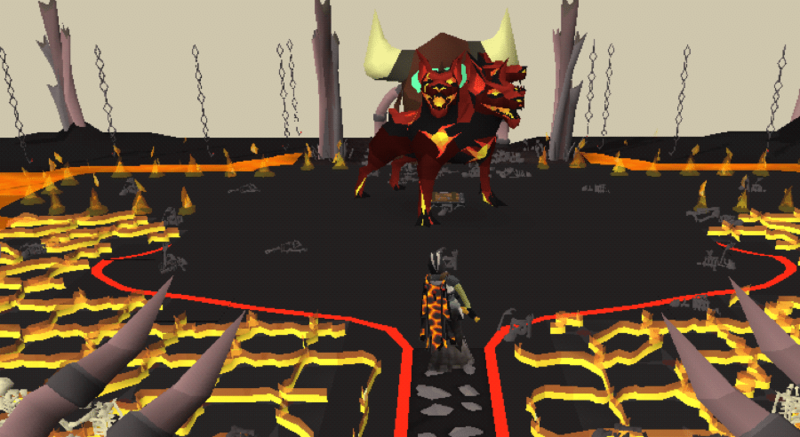 We’ve all heard about the infamous hellhound OSRS Cerberus which guards, well, obviously Hell. Have you all been to her lair in OSRS though? Because if you haven’t, it’s time to go on an adventure! In OSRS, Cerberus is a level 318 Slayer boss. She is the Guardian of the River of Souls and protects the departed on their trip to House Arceuus. Here’s the proof that we humans are not so unlike hellhounds – she keeps trying to slack on her job and abandons her post, because she’s so done with all that gloomy business she’s expected to do! Your task is to crawl into her lair and kill her. In order to fight her, you need to have Slayer level of 91 and to get assigned a hellhound task (quick tip: you may boost your Slayer level by baking wild pies but this works only if your level is already at least 86). To start the fight, you need to locate Cerberus’ lair first. It’s deep under the Taverley Dungeon at the hellhounds’ area. There is a small cave-like entrance through which you can crawl in. To get to Taverley Dungeon, you can teleport to Falador and use the wall shortcut close to the West bank. To navigate the dungeon, bring a dusty key regardless whether you plan to go around the long way or to take the pipe shortcut or run the mysterious flooring. To teleport straight into the lair, use Key master teleport which you can only obtain if you’ve fought Cerberus before and she dropped it. When you find OSRS Cerberus and approach her, she gets aggressive and attacks with magic, ranged and melee attacks. Her max hit is 23. An interesting thing about her is she can use the melee attack at range. Cerberus has high offensive stats but a low Defence level of 100. She is weak to melee attacks and particularly crush-based ones so you might want to use those. She resists best slash, magic and ranged attacks. Also remember that you can’t use the dwarf multicannon in the Cerberus’ lair. The hellish hound has three special attacks she may use under specific circumstances. When a fight starts, as well as around every 30 seconds after that, she attacks with a quick succession of magic, ranged and melee hits. If she is below 200 health, she may randomly spit three balls of fire – she growls when she does that – one of which is directed at a player and two at random spots in the room. Be careful not to stand close to one because this will continuous damage. Every seconds after she her health gets under 400 health she may summon three souls – she howls while she’s doing that – that rise from the river behind her and attack the player with every combat style. if you don’t block the attack, you lose 30 hp. If you block it, you get drained of 30 prayer (15 if you have the spectral spirit shield on). Cerberus respawns 5 seconds after she’s defeated. OSRS Cerberus can give you three different kinds of crystals – eternal, pegasian and primordial. You can use them to upgrade your infinity, ranger and dragon boots to eternal, pegasian, and primordial boots respectively. Those are the best boots for their combat styles. She also drops the smouldering stone, which you can use to upgrade your dragon axe, harpoon and pickaxe into infernal ones, much more often than the other hellhounds. Other valuable items she may drop are the hellpuppy pet and the jar of souls. Aside from the loot from the elite clue scroll she may drop, the average value of a kill is 94,273.55 OSRS gold. The one thing she always drops is ashes. This entry was posted in How-To Tips & Tricks, Latest OSRS News, Old School RuneScape, OSRS Mobile App and tagged cerberus guide, cerberus guide osrs, Cerberus osrs, osrs cerberus, osrs cerberus guide. Bookmark the permalink.